Knee replacement surgery. 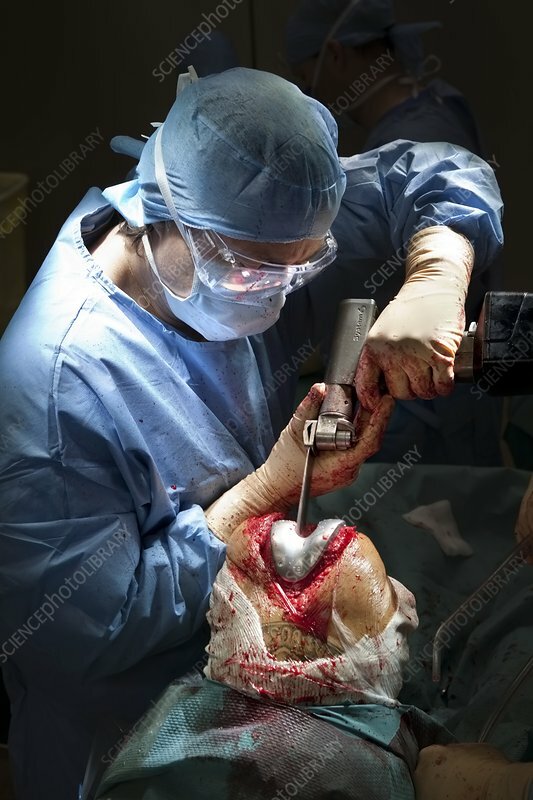 Surgeon performing a total knee replacement operation. In this operation, the damaged ends of the thigh bone (femur) and shinbone (tibia) are carefully cut away and shaped to fit the appropriately sized prosthetic replacement. A dummy joint is positioned to test that the joint is working properly. Adjustments are made, the bone ends are cleaned, before the final prosthesis is fitted. Knee joints need replacing when the protective cartilage that lines them is lost. Cartilage can be lost due to injury or arthritis.